The Longines Future Tennis Aces tournament has been organized by Longines since 2010. For eight successive years, every year Longines invites around 20 promising young tennis players who are around 12 years of age into this prestigious event. Each of the players come from a different country. For 2017, there were 20 young boys who came from 20 different countries, including Austria, Australia, China, France, Germany, Hong Kong, India, Italy, Japan, Korea, Mexico, Poland, Russia, Singapore, Spain, Switzerland, Taiwan, Thailand, the U.K. and the U.S.A. have been selected by their respective national tennis federations. The Boys’ Event and the Girls’ Event alternate each year. For example, the Boys played in 2015, then the Girls played in 2016, and then the Boys played in 2017. The Longines Future Tennis Aces tournament is held during the French Open season in Pairs, of which Longines has been the Official Partner and Timekeeper since 2007. In 2017, the three-day tournament was organized on the Parvis de la Défense. The players were officially presented to the public and press during a lucky draw ceremony which took place on the night, next to the Eiffel Tower, in presence of the patron of the event and former world number two Alex Corretja. The tennis youngsters enjoyed their time with eight-time Grand Slam Tennis champion and Longines Ambassador of Elegance, Andre Agassi, who was in town celebrating his 10-year relationship with the premium Swiss watchmaker. Agassi spoke to the tennis hopefuls about the tournament being an experience, not about winning or losing, suggesting the road is still very long for the 12-year-old champions, so it’s about learning, improving and focusing everyday and making yourself a little bit better, win or lose. 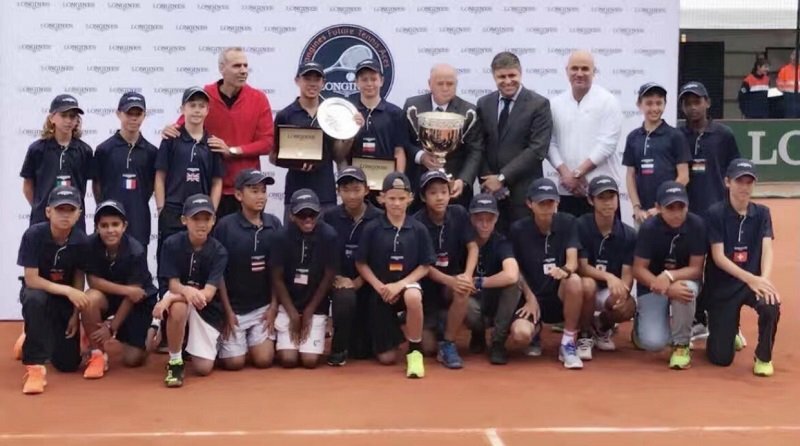 These tennis youngsters competed to determine who was the winner and he would then be awarded with a Longines watch, the tournament cup and an annual scholarship until his 16th birthday. This year the two finalists had the exceptional opportunity to play an exhibition match with Alex Corretja and Andre Agassi.